During Q1 2016, a total of 26 companies received $542 million in disclosed venture capital funding, representing a 13% decrease in the number of companies funded and a 13% increase in total amounts funded vs. the previous quarter. 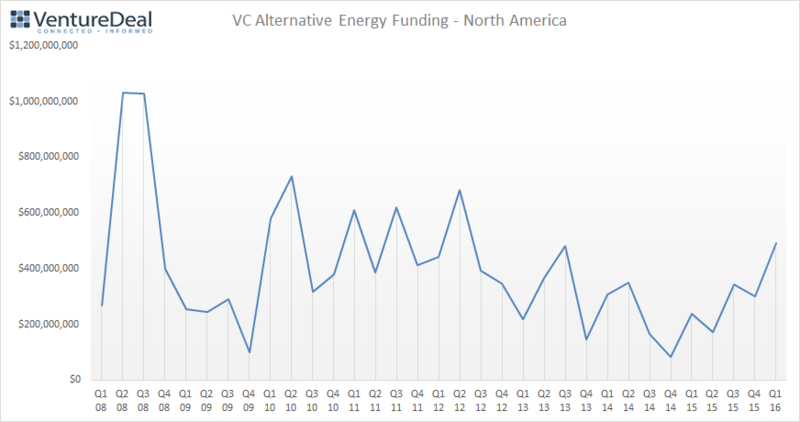 Alternative Energy companies, which include solar, biofuels, wind power, hydrogen and other non-fossil fuel energy firms, continued to receive the largest share of funding of the four industry sectors. 17 companies received $493 million in venture capital financing, which represented an 11% decrease in the number of companies funded and a 44% increase in funding amounts versus the f3rd quarter of 2015. In the largest deal of the quarter, Sunnova Energy of Houston, Texas secured $300 million equity capital in a financing round funded by private equity firm Energy Capital Partners. The company is a solar service provider to residential markets nationwide and said it would use the funding proceeds to accelerate its growth initiatives. 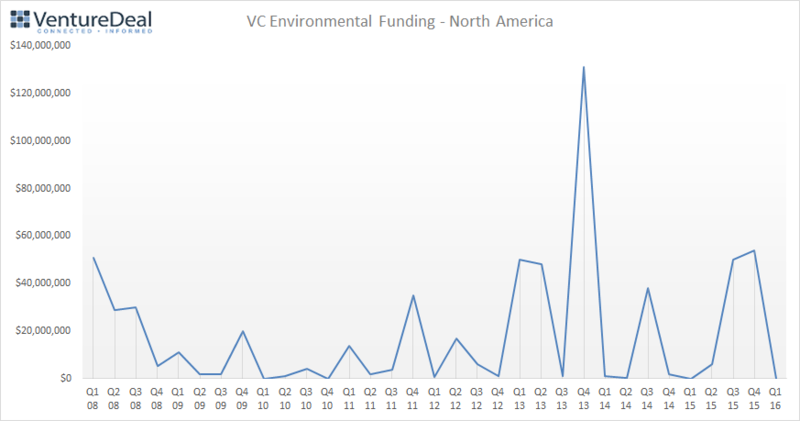 Clean Technology deal volume continued its previous quarterly results by decreasing to $23 million between 3 companies, a 63% decrease in aggregate funding amounts and an 11% decrease in the number of companies funded versus the Q3 2015. In the water treatment space, Clearas Water Recovery received $4 million in Series B venture capital funding from Next Frontier Capital and Good Works Ventures. The company has developed what it calls an Advanced Biological Nutrient Recovery system that recovers excess nutrients from municipal wastewater operations and produces no chemical by-products, reducing disposal fees. 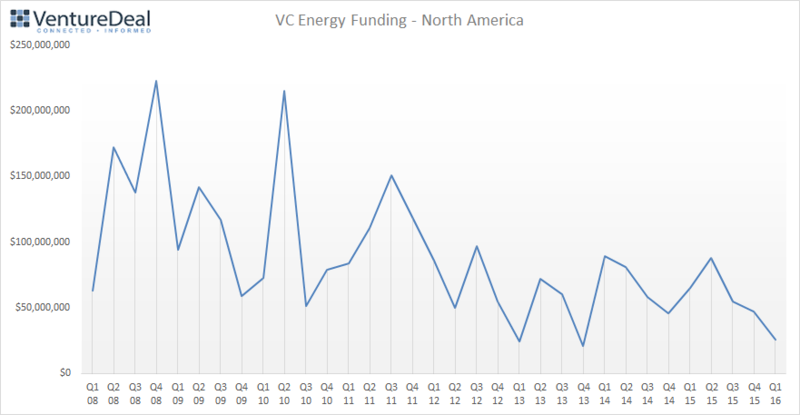 Venture-backed Energy company fundings decreased by 53% to $26 million. The number of companies funded tripled from 2 to 6 vs. Q3 2015. Waltham, Massachusetts-based battery technology company SolidEnergy secured $12 million in its Series B round of strategic and venture capital investment. The company says that it has “revolutionized portable energy storage with the introduction of the anode-free lithium metal battery.” Corporate investors in the round were SAIC Venture Capital and Applied Ventures. Gridtential landed $1.5 million out of a total offering of $2 million, according to an SEC regulatory filing. The company is developing an advanced lead-acid battery that it says will replace the metal grid in current lead-acid battery designs. Gridtential previously received funding from The Roda Group, which invested in a number of alternative energy, clean tech and software companies. There were no Environmental transactions during the quarter, continuing the same low or nonexistent activity in the sector.